IAMBRIGITTE : Go Pizza Crazy at Aria Cucina Italiana! 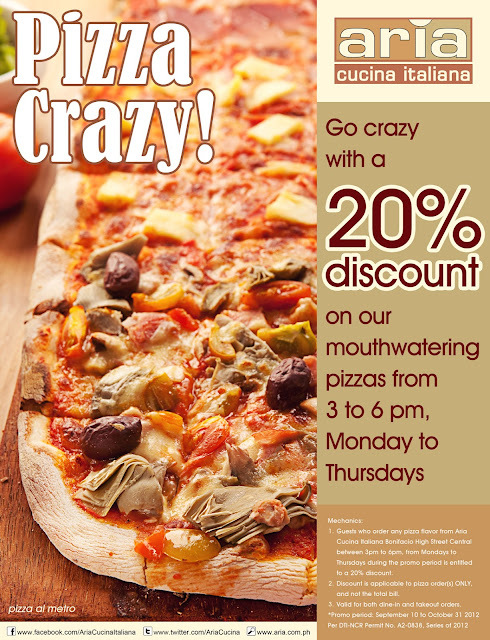 Go Pizza Crazy at Aria Cucina Italiana! 1. Guests who order any pizza flavor from Aria Cucina Italiana Bonifacio High Street Central between 3pm to 6pm, from Mondays to Thursdays during the promo is entitled to a 20% discount. 2. Discount is applicable to pizza order(s) ONLY and not the total bill. 3. Valid for both dine-in and takeout orders. Promo runs from September 10 - October 31, 2012. Let's all go gaga over the mouthwatering pizza at Aria! To know more about Aria and other promos, like them on Facebook and follow them on Twitter.